Spring in Maine. It’s like you can breathe again after 7 months, no more snow, actual green grass and flowers and flowering trees and rhubarb and my favorite……. strawberries. 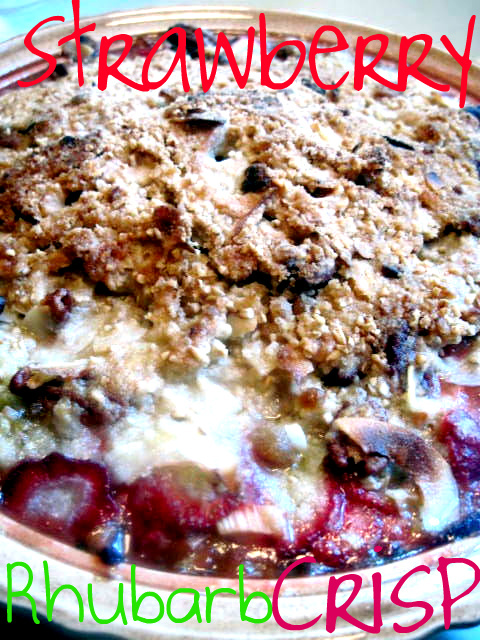 When I think of rhubarb, I automatically think of strawberry rhubarb crisp. So easy to make, so easy to eat! Combine the rhubarb, strawberries, apple, sugar, lemon juice, cornstarch and a pinch of salt in a 9″ x 13″ baking pan or a large pie dish. Toss gently to combine. In a large bowl, combine the oats, flour, and brown sugar, coconut and nuts. I love rhubarb, especially when it’s in crumble form. This sounds delicious and I love the sound of the coconut in the crumble topping too.